A well-respected, independent, third-party laboratory has tested for Tuberculosis (TB) using NanoLogix BNP (BioNanoPore) test kits and achieved the detection of live TB colonies in 4 to 5 days. Standard culture times for conventional technologies take a minimum of 16 to 21 days to achieve similar results. In concurrent tests for TB at the same facility, using Nanologix BNF (BioNanoFilter) test kits, Antibody/Antigen TB-specific test results were obtained in 1 hour 30 minutes. For research and publication purposes, all test results were confirmed with PCR. Comprehensive results of these independent tests are currently undergoing editing for publication in a major peer-reviewed, scientific journal. A major independent research facility is evaluating the shelf life of petri-based technology sealed in NanoLogix patent-pending "Flat-Pack" vacuum packaging. The results to date demonstrate shelf life of at least one year. The recommended shelf life for standard non-NanoLogix petri-based products packaged in standard packaging is currently three months. The U.S. Food and Drug Administration (FDA) announced today that AdenoPlus™ – an improved version of Rapid Pathogen Screening’s (RPS®) first point-of-care (POC) diagnostic test for conjunctivitis (pink eye) – has been granted waived status under the Clinical Laboratory Improvement Amendments (CLIA). Being granted this waiver classifies AdenoPlus as a low complexity device, which allows medical office personnel – not just a physician – to administer the test. Obtaining the CLIA waiver, in addition to the FDA 510(k) clearance that this next-generation product previously received, enables AdenoPlus to be used throughout the United States, an expansion from its current use in many international countries. Due to the overlap in signs and symptoms, many healthcare providers empirically treat all cases of conjunctivitis with topical antibiotics, which are ineffective against the viral form of the infection. As a result, this can lead many patients to return to school, work, or daycare while still contagious. This overuse of antibiotics also contributes to the growing concern of increased resistance to antibiotics. AdenoPlus allows for the rapid detection of Adenoviral antigens directly from human tears on the inside of the lower eyelid (conjunctiva). A nurse or technician can perform the test when a patient presents with a red eye or other symptoms of conjunctivitis. The patient can then be isolated while they wait only 10 minutes for the result. The speed and accuracy of the test result enables clinicians to make an accurate laboratory-quality diagnosis and provide the appropriate treatment plan before the patient leaves the office, reducing the spread of disease. AdenoPlus has greater analytical sensitivity than the first generation test and demonstrates a clinical sensitivity of 90 percent and a specificity of 96 percent when compared against cell culture – the gold standard – as the reference method. This level of accuracy allows for the initiation of appropriate patient management at the office visit and reduces future unnecessary medical office visits, the cost of ineffective antibiotic prescriptions, and the need for additional laboratory testing, resulting in healthcare cost savings of hundreds of millions of dollars per year. Much of the American public along with investors have probably forgotten about the 2001 anthrax attacks but a handful of stocks, including PositiveID Corporation, Northrop Grumman Corporation and Cepheid, have developed biothreat detection technologies that will hopefully prevent further bioterrorism or biowarfare attacks. Its also worth noting that two of these companies, PositiveID Corporation (PSID) and Northrop Grumman Corporation (NOC), are hoping to be suppliers for the Department of Homeland Security’s (DHS) BioWatch Gen-3 program which is worth $3 billion over five years. Starting with PositiveID Corporation, it’s a medical device company involved in the development of medical devices and molecular diagnostic systems for diabetes management plus rapid medical testing and airborne biothreat detection. On the biothreat detection side of the business, PositiveID Corporation’s MicroFluidic Systems (MFS) subsidiary is considered to be a leader in biothreat detection technologies and molecular diagnostic systems. In fact, it has already received $45 million in government and commercial contracts over the past ten years plus it has a strong IP portfolio of 29 patents or patents pending. Moreover and under contract from the Department of Homeland Security (DHS) over the past eight years, MicroFluidic Systems (MFS) has developed M-BAND technology – a so-called a Microfluidics-based Bioagent Autonomous Networked Detector that will scan the air for bio-warfare agents (e.g. anthrax) and operate on its own for as long as 30 days. More importantly and should PositiveID Corporation secure supplier status for its M-BAND technology (decisions will likely be made in 3Q2012), investors have a good reason to be excited given how much the program is worth and that the margins are expected to be in the 15% to 20% plus other government agencies like the Army will no doubt also want to acquire the devices. In addition to the M-BAND technology, PositiveID Corporation’s Dragonfly™ Rapid MDx Cartridge-based diagnostic system is designed to be a miniaturized point-of-care or field based system that has the ability to perform molecular diagnostic results from a sample in less than 30 minutes. Specifically, Dragonfly is effective at detecting a whole range of pathogens, including influenza, E. coli and methicillin-resistant staphylococcus aureus (MRSA), along with detecting radiation-induced cell damage. Meanwhile, defense industry behemoth Northrop Grumman Corporation reported about a year ago that it was field testing its own biodetector technology for the BioWatch Gen-3 program plus it has already delivered important assay technology to the DHS. However, I am not seeing any further updates from the company regarding field testing or deliveries. Finally, its also worth briefly mentioning Cepheid, a molecular diagnostics company that develops, manufactures and markets integrated systems for testing in the clinical market plus for applications in non-clinical biothreat, industrial and partner markets. On the biothreat front, Cepheid has developed tests that are designed for the surveillance of anthrax agents in environmental samples. However, Cepheid’s main focus is still products for the healthcare market rather than the biodetection market. Idaho Technology, Inc., a privately held clinical diagnostics company dedicated to providing the world's fastest, highest-quality instruments for pathogen identification and DNA analysis, today announced several posters will be presented highlighting its FilmArray® Respiratory Panel (FilmArray RP), a user-friendly Multiplex pathogen detection system, at the 28th Annual Clinical Virology Symposium and Annual Meeting of the Pan American Society for Clinical Virology, held April 22 - 25, 2012, in Daytona Beach, FL. In addition, the Company will showcase its FilmArray diagnostic platform at booth #233, where Idaho Technology representatives will be available to discuss FilmArray benefits and potential clinical applications. FilmArray RP is Idaho Technology's first clinical diagnostic test designed to run on the Company's novel FilmArray system, which represents a significant advancement in user-friendliness and multiplex infectious disease testing capability for hospital clinical labs. FilmArray RP rapidly detects nucleic acids in nasopharyngeal swabs obtained from individuals suspected of respiratory tract infections. Requiring only two minutes of hands-on time, FilmArray RP has about a 1-hour turnaround time, and simultaneously tests for the following panel of respiratory pathogens: Adenovirus, Coronavirus HKU1, Coronavirus NL63, Human Metapneumovirus, Influenza A, Influenza A subtype H1, Influenza A subtype H3, Influenza A subtype H1 2009, Influenza B, Parainfluenza virus 1, Parainfluenza virus 2, Parainfluenza virus 3, Parainfluenza virus 4, Rhinovirus/Enterovirus, and Respiratory Syncytial Virus. FilmArray RP is available for use by hospital and clinical laboratory professionals in the United States and Europe, and has received FDA-clearance for a panel of the above 15 targets and CE IVD registration for a panel of 21 targets. An expanded respiratory panel, which will include five additional bacterial and viral targets, is currently under review by the FDA. Idaho Technology is continuing to develop a broader test menu for its FilmArray system, including a blood culture ID panel, gastrointestinal panel, and an STD panel. 3M Food Safety announced today that its new 3M™ Molecular Detection Assay -- Salmonella has received AOAC-PTM Certification (#031208) from the AOAC Research Institute's Performance Tested Methods Program. The 3M Molecular Detection System was first introduced in December 2011 as an innovative combination of two technologies -- isothermal DNA amplification and bioluminescence detection -- that offers a reliable and rapid qualitative method of pathogen detection in enriched food, feed and food process environmental samples. The AOAC-PTM certification validates 3M's unique, molecular approach as equivalent to or better than standard FDA and USDA reference methods for the detection of Salmonella. It is projected that there are as many as 2 to 4 million cases of salmonellosis every year in the U.S. The AOAC Research Institute bases certification of methods on independent study results demonstrating that a given method meets the claims expressed in package inserts. For the 3M Molecular Detection Assay - Salmonella method PTM study, artificially contaminated samples were enriched and evaluated by the 3M Molecular Detection System as well as the appropriate FDA or USDA FSIS reference methods. These samples included evaluation of meat, poultry, eggs, seafood, produce and pet foods. No statistically significant differences in sample results were observed between the 3M Molecular Detection Assay - Salmonella and these reference methods. "This method validation is an important milestone, constituting the first of what we believe will be many confirmations of a robust and capable technology," said DeAnn Benesh, regulatory affairs specialist with 3M Food Safety. "Evaluation of Salmonella, and other pathogens using this technology, continues to be very promising, underscoring how the 3M Molecular Detection System's simple, streamlined method provides accurate results." 3M Food Safety is pursuing additional global method validations for the 3M Molecular Detection Assay -- Salmonella to present to the marketplace. The company developed the 3M Molecular Detection System and its test kits with the needs of its worldwide food processing clientele in mind, involving them early on in the design process. Ultimately, a small but powerful technology was produced, capable of targeting and amplifying nucleic acid in enriched samples with great success. Does the five-second rule really count? How strict is the expiration date on milk? What could those little bacteria really do to us? Are our food fears irrational? Scientists Benjamin Pascal and Marcia Pelchat will address these topics and more at "From Farm to Fork- Dangerous Foods: Facts, Fears and Foibles," Wednesday, April 25 at Rembrandts in Philadelphia. From Farm to Fork is part of the Philadelphia Science Festival. Benjamin Pascal, MBA is CEO and founding shareholder of Invisible Sentinel, a company located at the University City Science Center that develops rapid diagnostic devices that enable quick and accurate detection of foodborne pathogens. Invisible Sentinel hopes to become an industry leader for rapid, practical, and sensitive food diagnostics in the domestic marketplace and abroad. The company envisions that its Sentinels will become the standard in the industry while simultaneously benefitting mankind. Monell Chemical Senses Center scientist Marcia Levin Pelchat's major research interest is the development and modification of food preferences in humans. Recent investigations focus on improving rejection of novel foods, mechanisms of food cravings, and food preferences in the elderly. She speaks frequently to both scientific and gastronomic groups nationwide and is an Honorary Professor of Gastronomy at the Restaurant School in Philadelphia. Monell is also a resident of the Science Center. Dangerous Foods will begin at 6:30 p.m. on April 25. There is no charge for the event which will be held at Rembrandt's at 741 North 23rd Street. QIAGEN N.V. announced that the U.S. Food and Drug Administration (FDA) has granted two 510(k) clearances for its real-time PCR (polymerase chain reaction) instrument Rotor-Gene Q MDx and a compatible test for the detection of Influenza A/B, the artus Infl A/B RG RT-PCR Kit, for in vitro diagnostic use (IVD). "The FDA clearances for the Rotor-Gene Q MDx along with the first assay for use on this system represent an important milestone for QIAGEN," said Peer M. Schatz, Chief Executive Officer of QIAGEN N.V." The various Rotor-Gene Q models marketed by QIAGEN are not only an integral part of our revolutionary lab automation platform QIAsymphony RGQ, but are also among the most widely used stand-alone molecular detection platforms worldwide. Outside the U.S., our customers already have access to a broad portfolio of molecular diagnostic tests for use on these platforms. The FDA clearances now pave the way to make this market-leading assay portfolio available to clinical laboratories in the U.S. as well." The Rotor-Gene Q MDx instrument is an automated molecular detection platform based on real-time PCR technology. The system is intended for in vitro diagnostic use with FDA cleared or approved nucleic acid tests in clinical laboratories. The platform uses a unique centrifugal rotary design to amplify and quantify DNA molecules, enabling a near-perfect well-to-well thermal and optical uniformity and a fast data acquisition rate. These qualities make the Rotor-Gene Q MDxa preferred choice for IVD molecular diagnostic applications. The artus Infl A/B RG RT-PCR Kit is a multiplex real-time PCR IVD test intended to aid in differential diagnosis through qualitative detection and identification of Influenza A and B viral infections in nasopharyngeal swab samples using the Rotor-Gene Q MDx instrument. Influenza is one of the most frequent respiratory diseases. Since many flu-like symptoms may be caused by other pathogens, testing for influenza viruses helps to reduce the inappropriate use of antibiotics and to determine whether antiviral therapy would be appropriate. According to the Centers for Disease Control and Prevention, about 250,000 influenza tests are performed in U.S. laboratories during the annual flu season. Former versions of the artus Infl A/B RG RT-PCR kit were among the most widely used assays in the influenza epidemics 2005/2006 and 2009/2010 worldwide. The artus Infl A/B RG RT-PCR Kit is the first in a series of IVD molecular diagnostics that QIAGEN plans to launch on the Rotor-Gene Q MDx platform in the U.S. Several other PCR-based assays are either under regulatory review or are being prepared for submission to the FDA - for instance, proposed companion diagnostics based on mutations in the KRAS gene to guide colorectal cancer treatments and on mutations in the EGFR gene to guide lung cancer treatments, as well as an assay for detection of cytomegalovirus (CMV). Outside the U.S., the various models of Rotor-Gene Q high-performance real-time PCR cyclers already gained registrations as medical device in many key markets including the European Union, China, Japan, Korea, Brazil, Australia and Russia. 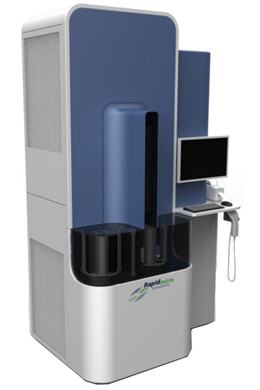 Subject to regulatory approvals in different regions and countries of the world, QIAGEN markets various Rotor-Gene Q models as a standalone IVD instrument or as part of the modular IVD platform QIAsymphony RGQ, which automates entire laboratory workflows from initial sample processing to the final result. Molecular Detection Inc. (MDI), a company developing Detect-Ready® tests designed to increase the speed and accuracy of infectious disease diagnosis, today announced that it has completed a $1.9 million Series B recapitalization financing. All existing MDI investors, including MentorTech Ventures, Robin Hood Ventures, Elm Spring Holdings and the Mid-Atlantic Angel Group participated. The Series B recapitalization financing is in addition to a $1.5 million funding round announced by MDI earlier this year. The funds will be used primarily to further advance MDI's Detect-Ready MRSA Panel and to develop MDI's new molecular diagnostic panels for the detection of sepsis and gastrointestinal (GI) infections in hospitalized patients. "This is an exciting time as we advance the development and commercialization of our Detect-Ready tests for serious infections that are prevalent in hospitals," said Todd Wallach, CEO and chairman of MDI. "We appreciate the continuing support of our investors, which will enable us to expand our market presence worldwide and continue development of our new panels for sepsis and GI infections." The Detect-Ready MRSA Panel is CE-marked for the detection of MRSA (methicillin-resistant Staphylococcus aureus) and MSSA (methicillin-sensitive S. aureus) pathogens. It is the only marketed PCR-based MRSA screening test with the proven ability to discriminate accurately between these pathogens and other related bacteria. The Detect-Ready MRSA Panel is currently available in the UK, Germany, Ireland, Switzerland, Spain, Austria, the Netherlands, Belgium, Luxembourg, Australia and Israel, and is in late-stage development in the US. MDI's Detect-Ready sepsis panel leverages MDI's patent-protected technology to pinpoint the source of the underlying infection and allow treatment to begin as soon as possible. Similarly, MDI's Detect-Ready gastrointestinal panel aims to be the first that can rapidly distinguish the source of serious GI infections in hospitalized patients. MDI plans to launch the sepsis and GI panels in the European Union during 2012. At the 22nd ECCMID (European Congress of Clinical Microbiology and Infectious Diseases) in London, Bruker announces new protocols and reference libraries for mycobacteria and multicellular fungi to further extend the microbial coverage of the MALDI Biotyper system for MALDI-TOF mass spectrometry-based microbial identification. Both groups of microorganisms pose major problems to private and public health care systems. Nowadays, bacteria of the Mycobacterium tuberculosis complex, for example, are reported again in countries again where they were thought to be eradicated. Nontuberculosis mycobacteria can cause severe health problems, especially in immune-compromised and senior patients. Previously, the identification of both groups of microorganisms has been a very demanding task in the routine microbiology laboratory. For mycobacteria, simple biochemical identification procedures are not available due to their high pathogenicity and their slow growth. Accordingly, secure inactivation protocols have to be employed first. Classical fungi analysis, on the other hand, requires deep expert knowledge about morphology and molecular biology of the species. Especially microscopy-based identification is error-prone, as morphology might change with different growth conditions or fungal growth stages. In recent years, the MALDI Biotyper has been proven to be a breakthrough microbiology identification tool compared to classical identification approaches, as it does not rely on any metabolic behaviour but on molecular proteomic signatures of the respective microbial species. With the new mycobacteria and fungi libraries this new paradigm was applied and validated carefully for two groups of microorganism, where conventional techniques were either error-prone, or expensive and difficult to implement in the laboratory. Dr. Markus Kostrzewa, Vice President for Clinical Mass Spectrometry of Bruker Daltonics, pointed out: "For both groups, we had to establish reliable sample preparation methods first, before we started to build up the respective reference libraries in order to ensure the identification quality that our customers expect from the MALDI Biotyper. In both cases the cooperation with our multinational consortia of collaboration partners has proven to be an important success factor. For mycobacteria, we had to develop the combination of a secure inactivation protocol and subsequent reliable cell disruption, using a silica-bead protocol to disrupt the cell wall and extract the proteins. This ensures the generation of highest quality reference entries for almost one hundred otherwise difficult to measure mycobacterial species. This new MALDI Biotyper workflow is suitable for mycobacteria grown on solid media, e.g. Löwenstein-Jensen medium, or in liquid culture using the BD MGIT™ system. For fungi, the major challenge was to prevent sporulation, as different stages of sporulation may have an impact on the resulting proteomic profiles. Subsequently, we have built up the fungi library from very well characterized fungi collections from the laboratories of our fungi consortium." Microbiologist Prof. Dr. Dag Harmsen, Head of Research & Development at the Department of Periodontology, University of Muenster, Germany commented: "MALDI-TOF mass spectrometry has been shown to have major clinical impact by fast species identification with broad species coverage. However, the technology was not readily available for the very demanding analysis of mycobacteria. In the past years, I have been deeply involved in molecular characterization of mycobacteria, for example by means of sequencing approaches. I am glad to see that now with the new mycobacteria library of Bruker´s MALDI Biotyper, this further dimension of molecular characterization by a proteomic fingerprint is also available for mycobacteria." Prof. Hof from the Mycology Laboratory of Laboratory of Limbach in Heidelberg, Germany pointed out: "The identification of multicellular fungi to the species level is one of the most challenging tasks of many microbiological laboratories in medicine, hygiene as well as in the food industry. In cooperation with Bruker's dedicated microbiology team we worked as part of an international group of fungi experts on the identification using the MALDI Biotyper approach. Based on Bruker's development of the fungi sample preparation procedure, we contributed, established and validated a reference library of a large panel of the most important fungal strains. Our common efforts during the last years have shown that MALDI-TOF based molecular fingerprint of fungi provides a high differentiation power both at the species and the strain level. The analytical performance of the MALDI Biotyper when used with the fungi library is a major technological breakthrough and practical improvement when compared to more conventional approaches and technologies using microscopy and sequencing methods only." New applications improve the efficiency of microbial quality control processes while significantly reducing the time-to-result. Rapid Micro Biosystems, the provider of automated, non-destructive detection and enumeration technologies in microbiology, today announced the 2013 availability of the next generation of Growth Direct™ applications. The tests are specifically designed for environmental monitoring and sterility applications in pharmaceutical quality control laboratories. Representing a quantum leap from the current sterility and environmental monitoring test methods, the applications are based on the detection of natural auto-fluorescence of microorganisms. The Growth Direct™ System requires no additional reagents to detect growing colonies. The Growth Direct™ System for Environmental Monitoring automates the high volume testing typically found in the combination of air, surface and personnel monitoring. Two results in one: Positive results in hours, with continued incubation for final results in half the time of the compendial method. Large capacity: Designed to handle high numbers of samples per day. Added efficiency: Automated reading of all environmental monitoring tests and data transfer to laboratory information systems (LIMS) frees resources for higher value activities. Actionable reporting: System alerts users immediately and trending analysis uncovers developing problems. Non-destructive: Analysis is non-destructive, allowing for microbial identification. Positive results in hours: Early real-time of microbial contamination, allowing for faster response to contamination events. Non-destructive test: Samples with positive results can continue to grow for additional analysis of the micro organism colony. Closed-loop sample prep: Aseptic sample preparation and testing of both aerobic and anaerobic microbes. 7 days versus 14: The typical sterility test requires 14 days. The Growth Direct™ for Sterility will provide final results in about half the time. Quantitative results: An actual colony count (in colony forming units) is provided at the end of the test, with regular count updates throughout the test. These new applications build on the existing Growth Direct™ technology currently used in FDA regulated manufacturing facilities. As with the Growth Direct™ System for Water and Bioburden, sample preparation mimics the existing method including the ability to integrate to a laboratory information management system (LIMS). Once samples are loaded, the system uses the natural auto-fluorescence of the living cells to automatically analyze and enumerate any growing colonies. User configurable software allows for the creation of alerts on out-of-specification samples, with reporting in colony forming units (CFU’s.) The test is non-destructive and uses no reagents, ensuring the availability of the sample for identification. “These new applications for automated, rapid sterility and environmental monitoring testing address critical microbial quality control testing needs in pharmaceutical manufacturing. Businesses will be able to react more quickly to contamination events while increasing productivity and standardizing their QC processes,” said Steve Delity, President and CEO of Rapid Micro Biosystems. The new systems and applications will be available in the first half of 2013. Quidel Corporation announced today that it received CE mark for the Quidel Molecular Direct C. difficile Tox A/B assay for the detection of toxigenic Clostridium difficile bacterial DNA. C. difficile infection is frequently associated with antibiotic therapy and often causes diarrhea and inflammation of the colon. "A recent study by the CDC suggested that nucleic acid amplification tests can be as much as twice as sensitive as enzyme immunoassays," said Dr. Timothy Stenzel, M.D., Ph.D., chief scientific officer of Quidel. "Preventing transmission of C. difficile by early and accurate detection in order to isolate and properly treat patients with Clostridium difficile infection is essential to reducing the overall disease burden." This Quidel Molecular Direct C. difficile Tox A/B assay is part of Quidel's expanding line of molecular diagnostics products. The Quidel Molecular product line offers PCR reagent kits for use by molecular diagnostic laboratories with their existing thermocyclers. These reagents provide attractive features that include refrigerated storage (no freezer required), convenient ready-to-use reagents, a short time to result, and other benefits that favorably affect diagnostic test outcome. The Quidel Molecular Direct C. difficile Tox A/B assay kit includes an extraction-free, three-step sample preparation process that requires no heat step, no timed step, and no centrifugation as an added benefit. This fast and easy direct-to-amplification procedure allows the assay to generate a result in less than 60 minutes by an efficient and economical method. "Quidel is committed to providing a continuum of diagnostic products for key infectious diseases to meet the needs of various lab settings," said Douglas Bryant, president and chief executive officer of Quidel Corporation. "This PCR assay, along with our CE marked AmpliVue assay and our cell culture-based Toxin Detection System for C. difficile will help meet the testing volume and resource needs of many different types of labs. In receiving CE Mark for our second molecular assay for C. difficile, we have expanded our molecular offering beyond respiratory infections." The Quidel Molecular Direct C. difficile Tox A/B assay is Quidel's first assay with a streamlined stool processing procedure. It is available for sale in Europe. Quidel also sells other CE Marked molecular tests in the Real-Time PCR format for Influenza A+B, hMPV, and RSV + hMPV. This assay is Quidel's fifth molecular product offering in the last seven months to receive authorization to market in Europe. Meridian Bioscience, Inc. announced it has signed a new group purchasing agreement with the Premier healthcare alliance to offer illumigene® C. difficile and illumigene Group B Streptococcus to its members at specially negotiated pricing. Premier serves more than 2,500 U.S. hospitals and 81,000-plus other healthcare sites. This agreement allows Premier alliance facilities to implement rapid, sensitive molecular tests for C. difficile and Group B Streptococcus without individual negotiations. Premier’s mission is “to improve the health of communities” and using the power of collaboration to lead the transformation to high-quality, cost-effective care aligns with Meridian’s promise to provide a new standard for patient care with our innovative diagnostic testing solutions. Meridian is privileged to be awarded this agreement with Premier and Premier members to assist their efforts to improve quality of patient care and reduce healthcare costs. The illumigene molecular system utilizes loop-mediated isothermal DNA amplification (LAMP) technology. The test procedure is remarkably simple, highly sensitive, and yields results in less than one hour. It requires no expensive capital equipment. The test relies upon a simple procedure that includes heat treatment, amplification and detection. The entire amplification is isothermal and results are read on the illumipro-10™ instrument. All reagents and disposables are contained in the test kit and can be stored at room temperature. Meridian believes that the “point-of-care” simplicity of this technology, along with its cost efficiency, make illumigene ideal for helping in early diagnosis and proper management of preventable and treatable diseases, especially in those instances where there is a low level of the biological target. Even the smallest quantity of Salmonella can wreak havoc for growers and food processors. But now science may be closing in on a way to easily detect the potentially deadly organism. The technology is called “SERS,” the acronym for "surface-enhanced Raman scattering." And it has nothing to do with noodles. U.S. Department of Agriculture scientist Bosoon Park is leading exploratory studies of this analytical technique's potential for quick, easy and reliable detection of Salmonella and other foodborne pathogens. According to the U.S. Centers for Disease Control and Prevention, Salmonella causes more than one million cases of illness in the United States every year. If SERS proves successful for cornering Salmonella, the technique might be used at public health laboratories around the nation to rapidly identify this or other pathogens responsible for outbreaks of foodborne illness, according to Mr. Park, an agricultural engineer with USDA's Agricultural Research Service in Athens, Ga.
What's more, food makers might use SERS at their in-house quality control labs. In a SERS analysis, a specimen is placed on a surface, such as a stainless steel plate, that has been "enhanced" or changed from smooth to rough. For some of their research, Mr. Park's team enhanced the surface of stainless steel plates by coating them with tiny spheres, made up of a biopolymer encapsulated with nanoparticles of silver. Rough surfaces, and colloidal metals such as silver, can enhance the scattering of light that occurs when a specimen, placed on this "nanosubstrate," is scanned with the Raman spectrometer's laser beam. The scattered light that comes back to the spectroscope forms a distinct spectral pattern known as a Raman spectral signature, or Raman scattered signal. Researchers expect to prove the concept that all molecules, such as those that make up Salmonella, have their own unique Raman spectral signature. The idea of using a substrate of silver nanoparticles for Raman spectroscopy is not new. But in SERS studies to detect foodborne pathogens, the use of a surface — enhanced with biopolymers coated with silver nanoparticles — is apparently novel. In work with comparatively large concentrations of two different kinds, or serotypes, of Salmonella enterica — Enteritidis and Typhimurium — Mr. Park's tests showed, apparently for the first time, that SERS can differentiate these two serotypes. With further research, SERS may prove superior for finding very small quantities of bacteria in a complex, real-world background, such as a food or beverage sample, says Mr. Park. Quest Diagnostics, the world's leading provider of diagnostic testing, information and services, today announced that the U.S. Food and Drug Administration (FDA) has granted 510(k) clearance to its Simplexa C. difficile Universal Direct Test on the 3M™ Integrated Cycler. The test, from the company's Focus Diagnostics business, is intended to aid in the diagnosis of Clostridium difficile-associated disease, one of the most common and dangerous acquired infections in healthcare settings. It uses a proprietary technique to eliminate the time consuming nucleic-acid sample extraction process required by many other molecular tests, for potentially faster results reporting for hospitals and clinical laboratories. Simplexa tests, running on the 3M™ Integrated Cycler, employ real-time polymerase chain reaction (RT-PCR) to qualitatively detect viruses, bacteria and other analytes. The Simplexa C. difficile Universal Direct test is performed on liquid or unformed human stool samples and detects the toxin B gene (tcdB) of C. difficile, including NAP1. The test uses a proprietary chemistry that eliminates the need for nucleic-acid extraction. Using the Simplexa test, hospital and other labs may complete the entire testing process in about an hour. C. difficile-associated disease is a common and sometimes fatal healthcare-associated infection that causes diarrhea and other intestinal problems. As many as 14,000 people die of C. difficile-associated disease in the United States each year, according to the U.S. Centers for Disease Control and Prevention. "Detecting and containing C. difficile associated disease is one of the greatest clinical challenges in today's healthcare environment," said Jay M. Lieberman, M.D., medical director, infectious disease, for Quest Diagnostics and Focus Diagnostics. "Fast, reliable PCR tests that are highly specific and sensitive in the detection of the tcdB gene, a toxin-B producing gene of C. difficile, are essential for identifying and treating this infection as well as containing its spread." With the FDA clearance, the Simplexa C. difficile Universal Direct Test on the 3M Integrated Cycler is immediately available in the United States. Focus Diagnostics launched the test in Europe during the second quarter of 2011. Focus Diagnostics, a wholly-owned business of Quest Diagnostics, develops and manufactures the Simplexa line of molecular test products operating on the 3M™ Integrated Cycler, a compact, portable testing platform, as part of an exclusive global collaboration with 3M™. Simplexa was the first test kit to be FDA cleared for aiding in the detection and differentiation of the 2009 H1N1 influenza virus, in May 2010. Additional FDA-cleared Simplexa tests aid the detection of influenza A and B and respiratory syncytial virus. Several other Simplexa-branded tests, including for Clostridium difficile, Epstein Barr and BK viruses, are CE marked and distributed in Europe. In 2011, the Simplexa/3M technology won a gold Medical Design Excellence Award in the in vitro diagnostics category and an Edison Award for new science and medical diagnostic product. Diagnostic tests that rapidly detect disease-causing viruses in animals and humans are being developed by U.S. Department of Agriculture (USDA) scientists using a new technology called "surface-enhanced Raman scattering," or SERS. With SERS, molecules give off their own unique signals or wavelengths that can be detected with a spectroscope. Viral molecules are labeled with a dye that makes them detectable when a laser is shone on them. Moving a metal such as gold or silver close to the labeled molecules greatly enhances the detection signal. Microbiologist William Wilson at the Agricultural Research Service (ARS) Center for Grain and Animal Health Research in Manhattan, Kan., used this technology to identify viruses that can cause West Nile fever and Rift Valley fever, both of which are spread by infected mosquitoes. ARS is USDA's chief intramural scientific research agency. Wilson and his collaborators at the University of Wyoming designed a nucleic acid diagnostic assay to bring molecules close to gold nanoparticles in solution. The gold nanoparticles boost the spectroscopic signal from the indicator molecule, making it easier to detect viral nucleic acid from infected cells. They also developed an immunoassay that rapidly detects antibody responses to viruses. Scientists hope to eventually adapt the assay to field-based bedside or pen-side diagnostic tools. For example, an instrument similar to a dipstick could be used to rapidly determine areas where a disease outbreak is occurring. Veterinarians could take blood samples from animals on farms, put the samples in small vials and read them with a hand-held device to determine if a virus is present. Another advantage of the assay is that it can be used to test for multiple pathogens, whereas current pen-side tests are generally agent-specific. The sensitivity of the new diagnostic assay is also greater than the current pen-side system and potentially as good as widely used polymerase chain reaction-based tests. Researchers at the University of Central Florida have developed a novel technique that may give doctors a faster and more sensitive tool to detect pathogens associated with inflammatory bowel disease, including Crohn's disease. The new nanoparticle-based technique also may be used for detection of other microbes that have challenged scientists for centuries because they hide deep in human tissue and are able to reprogram cells to successfully evade the immune system. The microbes reappear years later and can cause serious health problems such as seen in tuberculosis cases. Current testing methods to find these hidden microbes exist, but require a long time to complete and often delay effective treatment for weeks or even months. UCF Associate Professor J. Manuel Perez and Professor Saleh Naser and their research team have developed a method using nanoparticles coated with DNA markers specific to the elusive pathogens. The technique is effective and more accurate than current methods at picking up even small amounts of a pathogen. More important, it takes hours instead of weeks or months to deliver results, potentially giving doctors a quicker tool to help patients. "Our new technique has surpassed traditional molecular and microbiological methods," said Naser, a professor at the UCF College of Medicine. "Without compromising specificity or sensitivity, the nano-method produced reliable and accurate results within hours compared to months." The team created hybridizing magnetic relaxation nanosensors (hMRS) that can fish out and detect minuscule amounts of DNA from pathogens hiding within a patient's cells. The hair-thin hMRS are composed of a polymer-coated iron oxide nanoparticle and are chemically modified to specifically bind to a DNA marker that is unique to a particular pathogen. When the hMRS bind to the pathogen's DNA, a magnetic resonance signal is detected, which is amplified by the water molecules that surround the nanoparticle. Then the researcher can read the change in the magnetic signature on a computer screen or portable electronic device, such as a smartphone, and determine whether the sample is infected with a particular pathogen. The researchers used Mycobacterium avium spp. paratuberculosis (MAP), a pathogen that has been implicated in the cause of Johne's disease in cattle and Crohn's disease in humans, to test out their technique. They used a large number of blood and biopsy tissue samples from patients with Crohn's disease and meat samples from cattle with Johne's disease. "It is all about giving medical professionals easy and reliable tools to better understand the spread of a disease, while helping people get treatment faster," said Perez, who works at UCF's Nanoscience Technology Center. "That's my goal. And that's where nanotechnology really has a lot to offer, particularly when the technology has been validated using clinical, food and environmental samples as is in our case." The National Institute of General Medical Sciences (NIGMS), which is a part of the National Institutes of Health, and funded the research, said this kind of basic research can provide the foundation for medical breakthroughs. "Just last year, Dr. Perez and his team unexpectedly discovered the DNA binding property of their magnetic nanosensors, and now they have shown that it may become the basis for a rapid, sensitive lab test for hard-to-measure bacteria and viruses in patient samples," said Janna Wehrle, Ph.D., of NIGMS. "This is a wonderful example of how quickly an advance can move from the research bench to meet an important clinical need." Life Technologies Corporation announced that the U.S. Food and Drug Administration has extended its recent method equivalency finding of the Applied Biosystems TaqMan® Salmonella Enteritidis Detection Kit to test poultry eggs for additional use on environmental samples at production houses where the breakfast staple is handled and packaged. he kit had previously received interim approval for environmental sample testing by the National Poultry Improvement Plan (NPIP), a division of the United States Department of Agriculture (USDA), which governs safety standards at poultry houses that produce animals destined for dinner tables around the world. This equivalency finding gives Life Technologies regulatory approvals for testing SE in egg and poultry houses. The latest government findings now provide egg producers and the poultry industry the market's only PCR-based (polymerase chain reaction) tool, to quickly and accurately determine the presence or absence of Salmonella Enteritidis (SE) in drag swab samples taken from production lines by directly zeroing in on the pathogen's DNA. Compared to conventional, culture-based methods of detection, the kit reduces the time to results to 27 hours versus 72 hours - roughly 10 times faster for egg samples, and three times faster for environmental drag swab samples. This kit accurately differentiates SE from other serogroup D1 Salmonella to which SE belongs. "We appreciate the work of Life Technologies to develop testing methods and tools that will provide egg farmers with rapid, reliable test results so that eggs are not withheld from the market even one day longer than necessary," said Gene Gregory, President and CEO of United Egg Producers. Preventing, rather than simply responding to, SE contaminations has become the prime focal point for the egg and poultry industries, which must now conform to stricter federal regulations outlined in the Food Safety Modernization Act (FSMA). Congress passed the FSMA in December 2010 in an effort to curtail the number of high-profile food pathogen outbreaks, the most recent of which sickened at least 2,000 people and prompted the recall of more than 500 billion eggs in the summer of 2010, according to the Associated Press. Life Technologies developed the Applied Biosystems TaqMan® Salmonella Enteritidis Detection Kit in response the Federal Egg Safety Program and launched it in January 2011 when the FDA determined that the test was equivalent in accuracy, precision and sensitivity to its current standard methods described in the federal agency's Bacteriological Analytical Manual (BAM, December 2007 Edition). Passed in July 2010, the Egg Safety Program requires all large-scale egg producers in the U.S. -- roughly 80 percent of the egg production industry -- to test for SE, and is estimated to reduce annual Salmonella-related illnesses and deaths by 60 percent, according to the FDA. "Acceptance of our detection kit for Salmonella Enteritidis by the FDA and the NPIP is in line with our strategic goal to provide the most accurate of reliable molecular tools, and to continue growing our business in this sector," said Nir Nimrodi, Vice President and General Manager of Animal Health and Food Safety. "In addition to providing a valuable testing method with dual uses, the kit can help producers easily conform to federal regulations." Lab21 in Cambridge is partnering a world-leading diagnostics company to find a fast detector for a fungus that can kill patients whose immune system is compromised. The identity of the partner is not being disclosed and financial details of the agreement are also being kept secret. The partners are fighting Aspergillus. Infection caused by Aspergillus is a leading cause of death in immunocompromised patients, with an estimated 10 million people at risk globally each year. Studies have shown that diagnosis of Aspergillus infection followed by antifungal treatment within the first 10 days of infection reduces mortality from 90 per cent to 40 per cent – highlighting the need for rapid, accurate testing. Real-time polymerase chain assays using Lab21 technology have been shown to provide significant advantages in sensitivity and specificity over the current culture techniques. Lab21 and its global partner now plan to develop, manufacture and distribute a diagnostic assay for the detection of Aspergillus species for the partner’s real time PCR platform. CSO Berwyn Clarke added: “The platform we will be using for the new assay is one which is becoming increasingly well adopted within clinical diagnostic laboratories worldwide. InstantLabs Medical Diagnostics Corporation (InstantLabs®), developer of the portable Hunter Accelerated Real-Time PCR® system, today announced that its Salmonella Species Food Safety Kit has been certified as Performance-Tested Methods(SM) (PTM) No. 031202 by the AOAC Research Institute (AOAC-RI). The award follows independent laboratory studies conducted by Food Safety Net Services (FSNS). The PTM certification mark is widely recognized by a variety of organizations and government agencies and is awarded to products that have passed unbiased and rigorous evaluation, including tests for usability, success rates, task times and user satisfaction. "We are very pleased to have InstantLabs' Salmonella test kit certified by the AOAC-RI," said Steven Guterman, Chief Executive Officer of InstantLabs. "This assay, integrated with our Hunter instrument, allows food processors, distributors and growers to take advantage of the accuracy of gold-standard PCR technology for Salmonella testing right in their facilities, reducing the time to results and improving efficiencies." Salmonella is a genus of bacteria that are a major cause of foodborne illnesses throughout the world. The bacteria are generally transmitted to humans through the consumption of contaminated food, thus improved detection of contaminated food can reduce the incidence of illness. Salmonellosis constitutes a major public health burden and represents a significant cost in many countries. Millions of human cases are reported worldwide every year and the disease results in thousands of deaths. InstantLabs' Salmonella Species Test Kit, designed for use with the integrated Hunter real-time PCR instrument, aims to improve the process for detection of the relevant bacteria in food products. The assay enables the rapid and accurate detection of certain Salmonella serotypes. The test kit is available to the food industry and import/export organizations worldwide, for whom the ability to deliver the highest quality food products in the shortest possible window of time is crucial to public health and overall success of the organization. In addition to its Salmonella Species Test Kit, InstantLabs has food safety test kits available for Listeria species, Listeria monocytogenes and porcine DNA detection. A complete E. coli panel that addresses the new USDA FSIS regulations will be available shortly. Today's testing methods for dangerous and unintended organisms in food and ingredients do not routinely take advantage of real-time PCR technology. While real-time PCR is considered the gold standard for accuracy, its use has been limited by barriers including the need for highly specialized staff, the space for multiple components, technical complexity, time and cost. InstantLabs removes these barriers with its fully-integrated, compact and affordable Hunter Accelerated-PCR system, which requires only minimal space and basic training to deliver real-time PCR testing at the points-of-need. The portable Hunter system integrates chemistry-ready multiple assay cartridges (MACs) that enable highly accurate PCR testing in a fast, automated manner. This innovative system simplifies a historically cumbersome and time-consuming pathogen testing process, while assuring food safety and increasing efficiency. Idaho Technology, Inc., a privately held biotechnology and clinical diagnostics company dedicated to providing the world's fastest, highest-quality instruments for pathogen identification and DNA analysis, today announced the European launch of its FilmArray Respiratory Panel (FilmArray RP), a multiplex clinical diagnostic product that simultaneously detects 21 respiratory pathogens in about one hour. FilmArray RP is Idaho Technology's first clinical diagnostic test designed to run on the Company's user-friendly FilmArray system. The FilmArray RP received FDA 510(k) clearance last year for a panel of 15 analytes and recently achieved CE in vitro diagnostic (IVD) registration in the E.U. for a panel of 21 analytes. The Company also announced that it is partnering with the DiaMondiaL family of distributors in strategic territories throughout Europe. Each of these partners is well recognized as a leading supplier of laboratory instruments and testing services, and will now add FilmArray RP to their product offerings. The product is being showcased at the European Congress of Clinical Microbiology and Infectious Diseases (ECCMID), held March 31 -- April 3, 2012, at ExCeL London, London, UK (Booth 567). "Launching FilmArray RP in Europe represents a significant milestone for our clinical diagnostics business," said Kirk Ririe, Chief Executive Officer of Idaho Technology. "Along with our esteemed distribution partners, we are pleased to offer our user-friendly multiplex pathogen detection system to the broad community of clinical laboratory professionals. Our FilmArray system is capable of testing for a comprehensive panel of viral and bacterial pathogens in about one hour, while offering the user only two minutes of hands-on time, with no precise measuring or pipetting required. We believe this represents a significant advancement in the field of infectious disease detection, with the potential to improve the testing capacity of hospital clinical laboratories worldwide." Since launching in the U.S., FilmArray RP has experienced rapid adoption by the clinical laboratory community. In January 2012, Idaho Technology filed a submission with the FDA to clear five additional respiratory pathogens in an expanded panel for use on the FilmArray system. The Company expects to receive FDA clearance for the expanded panel in the second quarter of 2012. Idaho Technology is continuing to develop a broader test menu for its FilmArray system, including a blood culture ID panel, gastrointestinal panel, and an STI panel. FilmArray RP is Idaho Technology's first clinical diagnostic test designed to run on the Company's novel FilmArray system, which represents a significant advancement in user-friendliness and multiplex infectious disease testing capability for hospital clinical labs. FilmArray RP rapidly detects nucleic acids in nasopharyngeal swabs obtained from individuals suspected of respiratory tract infections. Requiring only two minutes of hands-on time, FilmArray RP has about a 1-hour turnaround time, and simultaneously tests for the following panel of respiratory pathogens: Adenovirus, Bocavirus, Coronavirus 229E, Coronavirus HKU1, Coronavirus NL63, Coronavirus OC43, Human Metapneumovirus, Influenza A, Influenza A subtype H1, Influenza A subtype H3, Influenza A subtype H1 2009, Influenza B, Parainfluenza virus 1, Parainfluenza virus 2, Parainfluenza virus 3, Parainfluenza virus 4, Rhinovirus/Enterovirus, Respiratory Syncytial Virus, Bordetella pertussis, Chlamydophila pneumoniae, and Mycoplasma pneumonia. FilmArray RP has received FDA-clearance for a panel of 15 of these targets and CE IVD registration for a panel of all 21 targets. The FilmArray is available for use by hospital and clinical laboratory professionals in the United States and Europe. BD Diagnostics, a segment of BD (Becton, Dickinson and Company), today announced that it obtained CE Marking of the BD MAX™ Cdiff Assay. The assay detects the toxin B gene (tcdB), which has been shown to be present in all toxigenic C. difficile and is essential for disease. "As CDI rates continue to increase in healthcare facilities worldwide, rapid molecular testing for detection of toxigenic C. difficile can help expedite appropriate treatment, reduce length of stay, and improve patient outcomes," said Tom Polen, President, BD Diagnostics - Diagnostic Systems. "The BD MAX Cdiff Assay launch is another important milestone in our effort to deliver a range of clinical tests on the BD MAX System, offering laboratories improved efficiency, turnaround time, and productivity." According to a recent study in the American Journal of Infection Control , nucleic acid amplification tests provide better sensitivity over enzyme immunoassay and glutamate dehydrogenase testing algorithms for detection of toxigenic C. difficile. C. difficile is a gram-positive bacterium that is responsible for the development of antibiotic-associated diarrhea and colitis that can progress to toxic megacolon, sepsis and death. More than 95 percent of antibiotic-associated pseudomembranous colitis cases are caused by CDIs, resulting in more than $1 billion in healthcare costs annually. The BD MAX Cdiff Assay represents the third CE-Marked assay on the BD MAX, the first fully automated bench-top molecular system designed to perform a broad range of molecular testing. The BD MAX System was developed to offer laboratories a simplified platform with true walk-away automation and the versatility to perform a broad range of molecular tests. At the 22nd ECCMID (European Congress of Clinical Microbiology and Infectious Diseases) in London, Bruker announces a collaboration with UMCG within the new European Network for the Rapid Identification of Anaerobes (ENRIA), based on Bruker's MALDI Biotyper system for MALDI-TOF mass spectrometry-based microbial identification. Anaerobic infections belong to the neglected infectious diseases and are often underestimated in their importance. However, anaerobic bacteria are important pathogens, composing also the majority of normal, probiotic bacterial flora on the mucosal surfaces and other bacterial ecologic systems in humans, animals and the environment. Furthermore, anaerobes are key in the growing biofermentor-based renewable energy industry. Knowledge is still lacking on the importance of anaerobes as human pathogens in many infection processes, and their role of being a possible reservoir for virulence and resistance genes. Therefore, a rapid and correct species identification of anaerobes is an indispensable prerequisite for future microbial diagnostics. Classic identification of anaerobes has remained cumbersome and difficult to standardize over recent decades. Thus, anaerobic bacteria remain often unidentified in clinical microbiological practice. The MALDI Biotyper has recently opened the possibility to use MALDI-TOF mass spectrometry for the rapid identification of anaerobic bacteria. In collaboration with the ESCMID Study Group of Anaerobic Infections (ESGAI), UMCG and Bruker, the new European Network for Rapid Identification of Anaerobes (ENRIA) has now been initiated ( http://www.escmid.org/research_projects/study_groups/esgai/ ). It is coordinated by the Dutch expert center for anaerobic bacteria at the Department of Medical Microbiology of the University Medical Center Groningen (UMCG) in the Netherlands and the Hungarian Reference Laboratory for Anaerobic Infections at the University of Szeged in Hungary. Since many years, both expert centers are leading in culture-based and molecular analysis of anaerobes, including oral and gut microbiology. ENRIA will set up an international and well-characterized anaerobic strain collection comprising of the most important anaerobic species, including parodontogenic bacteria. Reference spectra of this strain collection will be added to Bruker's MALDI Biotyper database. ENRIA will offer international workshops for standardization of MALDI-TOF MS usage in the identification of anaerobic bacteria. Finally, participating laboratories will perform a quality certification for the rapid identification of anaerobic bacteria with excellent quality using classical detection methods and MALDI-TOF MS. The initiators and ENRIA project lead partners are Prof. Alex W. Friedrich (Chair of Medical Microbiology and Head of the Department of Medical Microbiology of the University of Groningen), Prof. Elisabeth Nagy (Chair of the ESGAI group) and Dr. Wolfgang Pusch (Executive Vice President at Bruker Daltonics). Quidel Corporation announced today that it received CE mark for the AmpliVue C. difficile assay, its non-instrumented molecular test for the detection of toxigenic Clostridium difficile bacterial DNA. Detection of the pathogen is achieved using a hand-held fully contained detection cassette which utilizes lateral flow technology. C. difficile is frequently associated with antibiotic therapy and often causes diarrhea and inflammation of the colon. "Clostridium difficile infections can be life-threatening and are therefore critically important to diagnose as soon as possible. Molecular testing offers greater sensitivity and faster turn-around-times compared to many other methods," according to Dr. Timothy Stenzel, M.D., Ph.D., chief scientific officer of Quidel. A recent study published in the Lancet(1) suggests that a majority of the hospital-based labs in Europe continue to use traditional methods such as immunoassays or cytotoxicity assays. These assays may either lack sufficient sensitivity or are difficult to perform and may require several days to yield results. The AmpliVue C. difficile assay will allow these labs to quickly implement a fast and sensitive molecular method without the purchase of expensive capital equipment. "We are delighted to receive CE mark for our AmpliVue C. difficile assay," said Douglas Bryant, president and chief executive officer of Quidel Corporation. "The AmpliVue C. difficile assay will allow those labs that have previously opted for traditional methods to offer a more sensitive molecular test for patients in their care." The C. difficile assay is Quidel's first assay in the hand-held AmpliVue format, and is currently available for sale in Europe. Quidel also sells other CE Marked molecular tests in the Real-Time PCR format for Influenza A+B, hMPV, and RSV + hMPV. A simple test to identify MRSA in wounds could identify the superbug quickly and help prevent infection from spreading. Scientists have developed the test to show whether wounds or lesions are infected with bacteria and if MRSA is present. The test, developed at the University of Edinburgh in collaboration with NHS Lothian, works by taking swabs from a wound or sores. These are then analysed using a strip with electrical sensors that can detect MRSA. Researchers currently process the swab samples in the laboratory to increase the amount of bacteria present before testing them. They hope to avoid the need for this in the future by improving the strip’s sensitivity. Improving the strip's sensitivity would enable scientists to develop a test that could be used outside the laboratory, for example in GP practices or people’s homes. Detecting bacteria more quickly than compared to conventional tests would also enable more effective drugs to be given to the patient straight away. Currently, laboratory tests to confirm whether MRSA is present in a wound can take a full day using conventional techniques. The test was developed using swabs from diabetic foot ulcers taken from patients attending NHS Lothian’s Diabetic Foot Clinic at the Royal Infirmary of Edinburgh. Detection of MRSA in these patients is important to prevent the spread of infection, which can lead to the amputation of limbs and increase the risk of mortality. "Antibiotic resistance is becoming a pressing issue in modern healthcare and we are in serious danger of entering a post-antibiotic era. Current tests for MRSA tend to be expensive and not very fast. By developing a rapid and cost-effective test, we would know what kind of infection is present straight away, which will improve the chance of success in treating it," says Dr. Till Bachmann, University of Edinburgh's Division of Pathway Medicine. Edinburgh scientists are using similar technology to monitor signals that bacteria send to each other to spread infections, and chemicals that patients produce that indicate the wound’s response to the infecting bacteria. Understanding why bacteria release certain molecules as part of this process will help scientists identify the start of an infection and so treat it promptly. Research behind the test was presented at the Advances in Biodetection and Biosensors conference in Edinburgh. Molecular Detection Inc. (MDI), a company developing Detect-Ready® tests designed to increase the speed and accuracy of infectious disease diagnosis, today announced it will release a new version of its Detect-Ready MRSA Panel at the 22nd European Congress of Clinical Microbiology and Infectious Diseases (ECCMID). The superior performance of the Detect-Ready MRSA Panel has been further enhanced by increasing the number of MRSA strains it can detect, adding MRSA strains known to be missed by at least one other market-leading assay to the universe of all known common MRSA strains that were already included. The new kit also shortens the sample preparation process and minimizes required "hands-on" time. The Detect-Ready MRSA Panel is a qualitative real-time PCR in vitro diagnostic test. It is CE-marked for the detection of MRSA (methicillin-resistant Staphylococcus aureus) and MSSA (methicillin-sensitive S. aureus) and is the only marketed PCR-based MRSA screening test with the proven ability to discriminate accurately between these pathogens and other related bacteria. "We are delighted to offer this improved version of the Detect-Ready MRSA Panel to our growing customer base," commented David Wilson, MDI's Vice President for Commercial Operations, Europe. "The inclusion of additional covered MRSA strains reinforces the superior performance of our existing test, which was recently reconfirmed in an independent comparative study with a market leading competitor. In addition, the simplicity and ease-of-use of Detect-Ready MRSA is further enhanced with our new streamlined protocol for sample prep." Comparative data confirming the greater accuracy of the Detect-Ready MRSA panel was generated by researchers at St. Thomas' Hospital in London as part of an academic study. The study compared the performance of MDI's test and the Becton Dickinson GeneOhm MRSA PCR sold by BD Diagnostics. The researchers concluded that the Detect-Ready MRSA assay is superior to the GeneOhm panel in terms of specificity, while still providing a more rapid screening service compared to traditional microbiology culture methods. Detect-Ready kits are compatible with a number of the real time-PCR platforms currently found in most hospitals. Samples for testing are simple to obtain using nasal swabs and the kit's ready-to-use pre-mixed reagents require only the addition of patient sample to run the test, which provides results in less than three hours. Unlike other tests that require special handling, Detect-Ready kits are off-the-shelf room temperature-stabilized and require no refrigeration. The Detect-Ready MRSA Panel is currently available in the UK, Germany, Ireland, Switzerland, Spain, Austria, the Netherlands, Belgium, Luxembourg, Australia and Israel, and is in late-stage development in the US. Abbott announced today it has obtained CE Marking (Conformite Europeene) in the European Union to market its rapid, high-throughput PLEX-ID(TM) instrument, along with three assays for use on the system: PLEX-ID Viral IC Spectrum, PLEX-ID BAC Spectrum BC and PLEX-ID Flu. PLEX-ID, which is based on molecular diagnostic technologies, addresses a significant unmet need for rapid detection and identification of a broad range of microbes that cause infections in patients. It provides results in less than eight hours instead of the days or even weeks required for traditional culture methods. The unique advantage of the system is the ability to characterize a very wide range of microorganisms directly from clinical specimens, thus minimizing both the amount of time and laboratory work required to provide physicians important information they can use to best tailor treatment for the patient. "Ensuring that patients receive the most appropriate antimicrobial therapy as rapidly as possible has the potential to reduce inappropriate antibiotic prescribing, and help to reduce or slow the development of resistant bacterial strains," said Jacques Schrenzel, M.D., head of the Bacteriological Laboratory, University Hospital Geneva in Geneva, Switzerland. "PLEX-ID is the only available diagnostic technology that is capable of identifying a wide range of bacteria, viruses, fungi, and certain parasites in hours," said Murthy Simhambhatla, Ph.D., head of Abbott's Ibis Biosciences business. "The introduction of the PLEX-ID provides physicians and laboratorians a revolutionary new platform for the rapid etiologic identification of a wide variety of pathogens in patients." Research presented in several global scientific venues has shown that the PLEX-ID technology offers rapid detection and characterization of a wide range of pathogens, which can be extremely important in patients who have an impaired immune system such as those with cancer or patients who have had a transplant. The PLEX-ID Viral IC Spectrum assay is designed to detect and identify 11 viral families with more than 250 species of important systemic viral pathogens, including herpes simplex virus (HSV), cytomegalovirus (CMV), Epstein-Barr virus (EBV), human adenovirus, human enterovirus, BK and JC polyomaviruses, and parvovirus B19, directly from plasma specimens. These viruses represent a significant threat to vulnerable patients with weakened immune systems. Systemic viral infections are a serious problem, occurring in one out of every six transplant patients. Earlier detection can enable physicians to act more quickly to manage the patient's infection. The PLEX-ID BAC Spectrum BC assay can detect and identify nearly 400 species of bacteria, and also can detect the presence of genetic markers that determine bacterial resistance to certain antibiotics. In addition, the test can identify and classify species of Candida, a fungus that is an increasingly common cause of serious systemic infections. The assay performs this analysis on blood culture positive specimens. Abbott plans to introduce a modified version of the assay in Europe later this year which is designed to analyze the blood sample immediately after it reaches the lab rather than having to first wait for the organism to grow in culture. The PLEX-ID Flu assay is intended for detection and identification of known influenza A viruses, newly emerging influenza A strains, and influenza B. The unique power of PLEX-ID is achieved by combining the high levels of sensitivity and specificity of polymerase chain reaction (PCR) technology with the precision and accuracy of mass spectrometry. This breakthrough combination allows for identification and characterization of broad groups of organisms without having to narrowly focus on detecting each organism individually. The result is the ability to cover many more organisms than other rapid approaches. PLEX-ID provides comprehensive results that can enable physicians to act more quickly and manage patients more effectively. In 2009, PLEX-ID was recognized by both The Scientist and the Wall Street Journal as one of the top scientific innovations of the year. The Scientist honored the system because it can detect and characterize a broad range of microorganisms in any given sample. The Journal selected PLEX-ID as its Gold winner of the 2009 Wall Street Journal Technology Innovation Awards because it is designed to alert health officials to new disease strains, including H1N1 for public health surveillance, may also guard against bioterrorism and help hospitals identify antibiotic-resistant bacteria in their facilities. PLEX-ID is currently being used for non-diagnostic purposes by government agencies, law enforcement, health care manufacturers and other organizations.